One-kick wonder, overrated, all-show-no-go, etc. 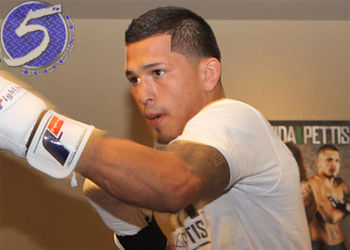 Former WEC lightweight champ Anthony Pettis (Pictured) has heard it all. As a matter of fact, Pettis’ fickle fans were pretty much letting him know as they were jumping off his bandwagon after losing to Clay Guida in his UFC debut. “I still got some loyal fans,” Pettis told UFC.com. “I can’t say everybody turned on me. It’s just that the fans that don’t really know who I am, they just saw the kick [on Ben Henderson last December]. ‘Oh man, look at this crazy kick this guy did,’ and they don’t really know my skillset behind that kick. But some of my fans are always loyal to me, they know that I have skills, and that I want this so much. While most can’t forget about the incredible cage-kick he unleashed on Henderson at WEC 53, “Showtime” knows he’s got plenty more tricks up his sleeve and is determined to showcase his entire repertoire. In an attempt to prove his naysayers wrong, Pettis locked himself inside of Duke Roufus’ Roufusport Martial Arts Academy in preparation for tomorrow’s UFC 136 shootout with Jeremy Stephens. School was back in session for the 24-year-old, and he’ll simply take his unanimous decision loss to Guida as a lesson learned. “I just live in the gym,” he shared. “I got back to becoming a student of the game and just learning everything. After the Henderson fight, I got so much media attention, the title shot in the UFC, all these appearances, all this hype, and no matter how many people tell you about it, you kinda gotta experience it for yourself to realize how it affects you and how it is. Pettis and Stephens will collide Saturday inside the Toyota Center in Houston, Texas.